Speaking at this year’s Gartner Business Intelligence and Information Management Summit in Sydney, Westpac head of CRM and digital, Karen Ganschow, talked through the bank’s efforts to leverage big data to improve the way it interacts with customers and deliver more relevant services to them. Westpac’s overarching ‘Know Me’ program aims to utilise customer data to better interactions on a one-to-one basis through every one of the banking group’s online and offline touch points. Westpac has 9 million customers across its various brands including St George. “Data helps us form a picture of the customer’s life journey and the next step they will take,” Ganschow said. 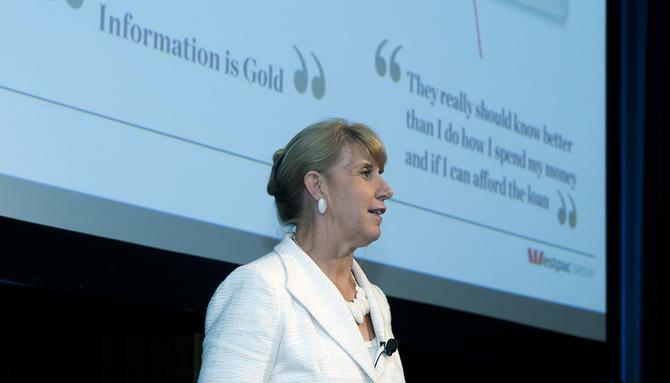 She highlighted three data assets driving Westpac ‘Know Me’ program. The first is growth in the variety and volume of data available about customers, ranging from transactional data through to newer assets such as social comments, online click stream information and customer notes. The second motivator for Westpac is even faster growth in the number of customer interactions it records today thanks to online and mobile banking take-up. Ganschow pointed out Westpac experienced 60 million online interactions with customers per month in 2013, up from 4 million in 2011, and expects this to reach 100 million per month by 2015. The third motivator is Westpac’s widening suite of products. These are being mapped against a customer’s life stages and provide a “moment of truth” along that path, she said. Westpac is using this information to provide a range of personalised communications to customers including reminders of when credit card payments are due, helping with new direct debits to a card, notifications around topping up super funds before the end of financial year, offering travel insurance when someone is transacting overseas, and congratulation notifications for paying off a home loan. It’s also making the sale process a more customer-centric one, Ganschow said. As an example of how Westpac is targeting customers with relevant and more useful offers, she detailed its ‘next best offer’ program. This relies on integrating all the data sources listed above to deliver real-time communication and offers that are based on what the customer wants, rather than what the banking is looking to sell. “The traditional approach is that the bank only called a customer where they had something to sell,” Ganschow explained. “Our staff and customers don’t like these calls, and it leads to a lower NPS [net promoter score] and more negative brand experience. The next best offer program is running across physical branches, call centres, the online portal, social media and Westpac’s online banking facilities. Since launching nine months ago, Westpac has chalked up 812,000 next best offer conversations with customers in branches, leading to a 37 per cent uptake rate. In the call centre, 490,000 customers have been targeted through the program with 60 per cent taking up an additional product, Ganschow said. Targeted online communications, which appeared in 80 per cent of customer online banking profiles, also generated $7.8 million in incremental revenue. In total, next best offers delivered $22 million in annualised revenue, double targets set at the start of the program. Ganschow said another notable impact is that even if customers don’t accept an offer made this way by call centre staff, Westpac’s NPS rises 10 points on the group’s average. Westpac has taken two-and-a-half years to move from proof of concept to this point with next best offer. Ganschow said the board had already bought into the vision of one-to-one marketing, a significant step in getting the investment across the line. Another key aspect to the program is ensuring that front-line staff are trained up and well versed in the offers as well as service-led selling, whether they be a teller or in the call centre. “Your key stakeholders in these programs are the front-line staff,” Ganshow told delegates. While the next best offers were proving a major success, Ganschow admitted learnings from the customers that chose not to take-up an offer were still largely anecdotal and that more needed to be done in this area. “It’s imperative to understand the customer opportunity and also spend time in the channel listening to what does and doesn’t work well,” she added. At present, 40 per cent of customers have a next best offer against them, and Westpac is working to scale up the program to the majority of its customers. To work out what offers to serve up, Ganschow highlighted a raft of technology capabilities the bank has invested in including SAS Marketing Optimisation and Real-Time Decision Maker platforms, as well as relational enterprise data warehousing.